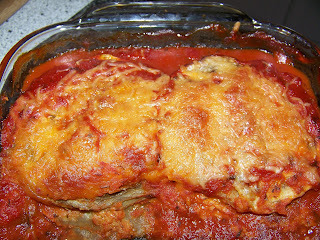 Eggplant parm has always been my go to Italian dish. I know not everyone is an eggplant fan, but I just can't get enough of this dish. Since it is normally breaded (some places don't bread it) I can't eat it when we go out (and it's really difficult to eat at any italian restaurant) and so I now make my own version. Depending on how many slices of eggplant you have you will need to use more or less of your ingredients. What I do is start with 2 medium size bowls and I crack 1 egg into one and whisk and in the other I put 1/2 cup of breadcrumbs, 1 tbsp oregano, 1 tsp paprika and 1 tsp garlic salt and mix. Then you take your slices of eggplant, dip both sides into the egg and then cover in the breadcrumb mixture and set aside. If you run out of egg or breadcrumbs, clean out your bowls and refill. Once your eggplant is covered, you have two choices. If you want a shorter cook time but slightly less healthy version, you can use a medium saucepan and cover the bottom with oil. Once heated, cook the eggplant in batches until the breadcrumbs are slightly browned. Transfer to paper towels and let cool. Preheat the oven to 350 degrees F. If you want a healthier version, you can skip the above step. Grease as large casserole dish and start by putting a thin layer of sauce in the bottom. Add a single layer of eggplant and then add another layer of sauce. Continue until you are out of eggplant. Cover the top with sauce and then sprinkle cheese on the top. If you previous cooked the eggplant, cook uncovered until the cheese is melted and the sauce is bubbly. If you didn't previously cook the eggplant, cook covered for about an hour or until the eggplant is very tender when poked with a fork. When the eggplant is almost done, cook your pasta. Let cool for about 15 minutes and then place the eggplant over the pasta. Enjoy!